This is a performative, interactive installation. The audience, or participant embarks on a creative, active journey. Bit by bit, each individual assembles their own personal narrative, helped along by our navigator; dance performer Olu Taiwo. Lizzie Sykes’ installations are constructed with the aim of creating an experience that’s personal or potentially unique for each individual watcher, either by a particular combination of images (Slice), the suggestion of being cocooned inside the image (Outside Close), or the size of the screen, allowing only one viewer at a time (Which Way is Up). More recently her work has invited participants to literally play with cameras and experience the physical response of the Unfairground Ride series, made with these spherical ‘ballcams’. Through exhibiting in gallery spaces, festivals, cinemas, café’s etc, I’ve been learning about approaches to participatory exhibiting. Olu Taiwo has recently completed a Phd in performance philosophy entitled ‘Interfacing with my Interface’. 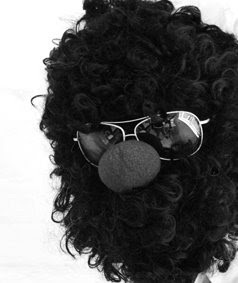 Olu is a dance performance artist and Senior Lecturer at Winchester University. Last summer Olu and Lizzie worked on a new piece at Salisbury Arts Centre. The piece was site specific: the arts centre is a converted church. 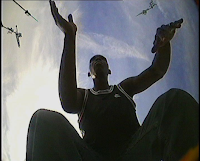 Using the ballcam, which is a ball containing a wide angle wireless camera housed, they created a series of improvisations on the roof of the bell tower of the centre and at the front of the church itself. This work was shown with the Unfairground Exhibition at Salisbury Arts Centre over the Summer of 2008. What follows are some initial concepts. Originally invented by the Chinese (although this is matter for some debate), the compass, has made an immeasurable impact on the development of our world: international trade, war, language and communication. It is embedded in our culture. Identifying and relaying our position in the world, charting a course, has developed into today GPS and satnav systems. Reconstruction of a Han Dynasty (206 BC – 220 AD) south-indicating ladle. Older compasses, like the compass rose pictured above, included the direction of Jerusalem. Churches were often aligned to cardinal points. The way churches functioned was, in turn, influenced by these points. The design has developed over time: Roman compasses had 12 points, not the 16/32 we have now. Early Chinese compasses didn’t have north as their key cardinal point. Globally, not all cultures needed them at sea as much as European sailors, navigating, as they still do, through deep water and cloudy skies, making soundings and navigation by stars difficult. So although probably not invented in the West, the compass, as we know it, is a Western construct. It’s emphasis on North and the names of the compass points themselves are Western developments. Some non western compasses are markedly different: they have a fifth point, in the centre. They use non primary colours to demark north, south, east and west. It’s thought this was related to the growing cycle of corn. Compasses are magical, complete. They can help you find the way, if you’re lost. They’re connected with transmigration, choice, chance, they remind me of a roulette table. Sailors’ lives depended on them. They’re a purely fantastic design. You can make one yourself with a needle, a bowl of water and a bit of cork. It detects the earth’s magnetic field, because the earth’s core is metallic. A staple of explorers, adventurers, travellers and pioneers. There’s a global, yet personal connotation to the compass: linking us to our own directions in life, our own chances and choices. Embarking on journeys, pilgrimages, getting lost, finding our way. The role of the navigator, then, as someone who plots a course, avoids hazards and guides travellers is pivotal. Rudolf Laban developed a theory of movement analysis. From Wikipedia, ‘Laban Movement Analysis (LMA) is a system and language for understanding, observing, describing and notating all forms of movement. Devised by Rudolf Laban, LMA draws on his theories of effort and shape to describe, interpret and document human movement. Used as a tool by dancers, athletes, physical and occupational therapists, it is one of the most widely used systems of human movement analysis. This theory, we can link with the compass, Olu’s writing around the return beat and the Lizzie’s movement based video work. ballcam n. – a wireless video camera with a wide angled lens embedded in a foam rubber spherical ball. The user can throw, catch or roll the camera, without causing damage. I made the ballcam because I wanted to explore sensations that are not achievable with a conventional camera. Capturing an awareness of height, of jumping, and landing were my initial motivations. I wanted to throw a camera in the air without breaking it. I wanted to achieve a closer contact with a camera: something more responsive and guttural, less precious or measured than the filmic style that regular cameras naturally lend themselves to. Working with dancers and the ball emerged via a progression that included launching the ball out of moving car windows, flying it off a cliff (it was tied to a kite), stringing it up in various landscapes, rolling it down a hill, and generally breaking it a lot. It became clear that the use of the ballcam wasn’t just about landscape – the way that people worked with it in workshops became really relevant to me. Participants were always coming up with new ways to use it. The way shapes of the human form could be played with and distorted. This was a departure in my work – before the ballcam I had always worked with landscape. The ballcam made me realise that working with performers was critical. Although eventually we moved out of the studio into the open air, so the work became a combination of landscape and movement. This is in it’s earliest stages of development, so the following is really a list of ideas. The participants find their way through the space, creating their own, individual experience. Helped along by our navigator, Olu. The floor plan could represent a compass. Each participant is, in fact, metaphorically, a compass; they decide where to go, what to pick up or leave along the way. We plan to use a combination of live performance, sound beam, pre recorded and live ballcam work. Olu has been developing ideas around thrown projects and participants using the sensors of soundbeam to activate images, movies and sounds. However, that participant is very much at the centre of this piece. H/She is an adventurer: playful, discovering, using the space, inside and out. There’s a saying, ‘boxing the compass’, meaning the act of recounting each compass point. This completes the journey. boredomresearch will be presenting their RealSnailMail research project on Tuesday 17th June, 2pm in the Coyne Lecture Theatre, Bournemouth University. We have now completed a prototype version of the webmail service and users can submit an email to the enclosure at Bournemouth University, where it will wait for a snail Agent to pick it up. We will be publishing all our research findings on the realsnailmail blog. All research will be featured when the work is exhibited at SIGGRAPH2008 'Slow Art' Gallery Exhibition in Los Angeles, 11th-15th August 2008. Happy slow emailing! Adam Gent, Arts Development Officer from Bournemouth Council was invited to give an informal talk on visual art projects that he is co-ordinating in Bournemouth including the Enchanted Gardens event in the lower gardens (August 2008) & the Bicentenary Streets of Bournemouth project (2010). Adam outlined how he is keen for local artists to contact him in regards to exhibiting their work in public spaces within the city. Projects presented included - Susan Sloan & Adam Vanner’s, collaborative 2nd Life Project with Niki McCretton . 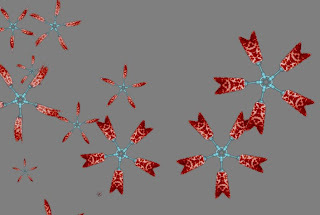 Peter Hardie’s new animations focused on simulating leaves floating on the surface of water. Boredomresearchs’ flower generating software which was developed for a public artwork in the Metrocentre Gateshead (image above). Lizzie Sykes current work in development exploring the compass rose and Paula Callus’s Phd research trip to Academie des Beaux Arts in Kinshasa. The VRG group supported my travel expenses for my fieldwork in Kinshasa in the DRC between the 11th - 31st May. During this time I participated on various workshops in scriptwriting, acting, sculpture and 3D Computer Animation, that were organised by Studio Malembe Maa and J.M. Kibushi. The workshops were held at the Academie des Beaux Arts in Kinshasa. Each workshop was designed to inform local artists with professional practice for animation. It also formed part of a larger project: the development of Project Ngando, the first feature length stop-motion film to be made by a Congolese director, J.M Kibushi. The workshops spanned across 3 weeks, and consisted of developments on the script's main plot line, narrative development and structure; development and design of characters as 2D drawings and later sculptures/ maquettes; movement studies and documentation of one key scene performed by actors and dancers. All workshops were heavily documented to retain this information for later production developments and resource material. The director, Jean Michel Kibushi, typically works on animations which derive from local Tetela tales, from the Kasai Oriental Region. The animations feature various techniques, although settling on stop-motion with silicon models, one of the most costly and difficult techniques. His films have had both local and international success featuring in various European festivals, and recently having a retrospective at the AFRIMATION event organised at SOAS, London. As part of on-going research into Sub-Saharan Animation, I have been following and documenting Jean-Michel's films within the specific political, social and anthropological context of the DRC, whilst situating it amongst a context of various artistic practices that inform his work. It is my intention to continue documenting the production of this film as it develops in time. The development of this research as it stands, has culminated in an article on Jean Michel Kibushi, and his films, that will be published within a book on African Film and Video (title due to be announced). Lead Tagtool developer Markus Dorninger will be coming over from Austria to do a demo session for VRG and IPE members and to talk about his work. The live drawing/animation system uses open source software, a graphics tablet, and a vision mixer and can be built into a flightcase making it completely transportable! Better still the Tagtool development team have posted details on the Instructables website on how to build one (see their webpage). Based in Austria, the team have been busy on the international festival circuit for a couple of years including Luminale and Node08 Festival this year. Come and meet Markus and have a go on the Tagtool! Tuesday 20th May at 1pm Talbot Campus- venue tbc. Please can you mail Dan Cox to confirm that you will be attending. The RealSnailMail project http://www.realsnailmail.net is moving at lightening speed we are just relying on the molluscs to slow things down. Over the last month we have teamed up with Tim Orman & Andrew Watson from The School of Design, Engineering and Computing http://dec.bournemouth.ac.uk/ at Bournemouth University to develop a prototype tank. This tank contains a small community of land snails Helix Aspersa. Each snail is equipped with a small glass capsule attached to its shell. The capsule contains a tiny chip and coil antenna that can be activated by a reader at a range of 3 cm. We are in the process of developing two purpose built readers that provide a link between the snails and the server allowing the snail to collect and deposit packets of information. boredomresearch aim to publicly launch the worlds first webmail service to use live snails for carrying electronic messages across physical space at Bournemouth University this Summer 2008. Once launched public can access the realsnailmail.net website at home and use it as an alternative webmail service. Email will travel at the speed of light to the realsnailmail.net server where it is entered into a queue. Here it waits until a real snail within the installation tank at Bournemouth University wonders in range of a hot spot. The hot spot is the dispatch centre in the form of a RFID reader. 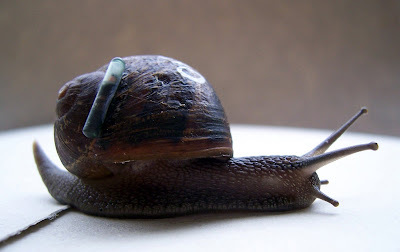 This reader identifies the snail from the RFID chip attached to its shell and checks to see it has not already been assigned a message to carry. If the snail is available it is assigned the message at the top of the list. It then slips away into the technological wasteland. Located at the other end of the tank is the drop off point. When, or if, the snail ever makes it here, it is identified by another reader, which then forwards the relevant message to the recipients email address; once again travelling at the speed of light. At each stage of the emails transit the sender will be updated with the messages progress and when the email finally arrives at its destination it is appended with details of its carrier and a log of its journey. The realsnailmail.net website encourages users to consider the efforts of a diminutive mollusc lugging their message across a tank and for this reason urges them to send a message of value. I received travel expenses to attend the last weekend of the Sk-Interfaces exhibition and talks at the Foundation for Art and Creative Technology in Liverpool (March 2008). Having seen much of Eduardo Kacs http://www.ekac.org/ work on the net it was good to see him talk about his projects, past present and future, including his work on telepresence. His desire with this work was to create a situation where one person becomes the ‘host’ of another person through the use of a wireless transmission garment which transmits what the host sees. The idea of co-habiting one body or seeing/experiencing the world through a host is an interesting one. It made me think about 2nd Life and also the work I’m doing with portraits and mocap. I also took part in the ‘Truth Serum’ Experiment by Neal White – Office of Experiments www.nealwhite.org/ . A thought provoking work where the pressure to tell the ‘truth’ was coupled with the fear of giving the ‘wrong’ answer and had me pleading, banging my hands on a desk and shouting at a video projection of typed questions in an empty room in a derelict building. I received travel expenses to attend Candy + Code, ICA london, March 2008. I was particularly interested to see the work of Dr Barbara Rauch - www.sciria.org.uk/ , research fellow at the Chelsea College of Art. She has been researching evolutionary aspects of human and animal conscious and subconscious facial expression. She has been using data capture, including laser scanning techniques, combining these with 3D visualisation such as morphing and blending of human and animal faces. Her installations include drawing, sound and performance. I was interested to learn how and why she uses data capture technology in her work and my aim is to follow this up. Rachel Beth Egenhoefer discussed her research as part of her Distributed South residency www.rachelbeth.net/work.html . Of particular interest is her research in tracking her everyday actions using knitting needles. She discussed using a wii controller attached to knitting needles to capture the patterns created by the cyclical action of knitting. In terms of my practice/research these events allowed me to network with other artists, some of whom are using similar technologies and themes but also to discuss how they practice and exhibit. The Visual Research Group [VRG] at Bournemouth University UK consists of internationally significant visual artists who utilise digital technology to create dynamic artworks. Member’s visual research and practice includes generative systems, 3D animation, gaming, film, innovative technology and interaction.